Our 12 night voyage begins in Edinburgh, Scotland for its journey through the British Isles with eight ports of call including Ireland's Portrush to attend the final day's play of The 148th Open at the magnificent Royal Portrush Golf Club (1888) The itinerary is beautifully balanced with famous city experiences such as Dublin, Belfast, Glasgow, Liverpool and Waterford combined with a visit to the charming Isle of Man and St Peter Port in the Channel Islands. Our call ... Read More. at Invergordon will take us to the very heart of the Scottish Highlands. Finally our voyage will conclude in Southampton on the south coast of England, convenient for one of the world's great capitals - London. The golf arrangements are exceptional. Your biggest decision may well be whether to join the MAX FAULKNER flight or the FRED DALY flight. Either way, you are assured of five fabulous rounds including a mixture of Royal Clubs and Open Championship. View the course collections below. The PerryGolf staff will oversee all aspects of your golf experience from daily pairings to caddie arrangements and the handling of your golf clubs, which will be set up at each club awaiting your arrival from the ship. The on board experience with Azamara is to want for nothing. Our companies partnered since 2011 and found an ideal match of form and function. The 690 passenger Journey is large enough to provide every comfort and amenity, yet nimble enough to navigate smaller harbours. Azamara is recognized as a specialist for "destination immersion" by providing more time in port than other major cruise lines. You'll find an impressive selection of Land Discoveries® that you can enjoy to their fullest. PerryGolf also offers accompanying non-golfing spouses the option to attend the final day's play of the 148th Open. It really is the perfect vacation for golfers and non-golfers alike! Forty-four suites are available on Journey, each attended by English-style butler service. Dining, wine, beer, spirits, coffees and sodas plus shuttle service to and from port communities, and more is inclusive along with all gratuities. Better yet, two full days at sea are scheduled for you to unwind with the help of this outstanding vessel. If you are inclined to indulge, we recommend you make your arrangements without delay. Embark Azamara Journey from 1:00pm onwards. All aboard 4:30PM. Welcome Cocktails & Briefing this evening and a chance to meet your fellow participants. Edinburgh - the inspiring capital of Scotland - is a historic, cosmopolitan and cultured city. The setting is striking; a city perched on a series of extinct volcanoes and rocky crags which rise from the generally flat landscape of the Lothians with the sheltered shoreline of the Firth of Forth to the north. Edinburgh Castle dominates the city-center and from its ramparts you can look down on medieval lanes that hold over a thousand years of history, mystery and tradition. You will also see a modern, dynamic capital where international festivals attract the world's leading performers, galleries display cutting-edge art, and bars, restaurants and clubs create a lively, cosmopolitan atmosphere with a distinctly Scottish twist. No visit to Edinburgh would be complete without a walk up the Royal Mile, which stretches from the Palace of Holyroodhouse, the Queen's official residence in Scotland, to Edinburgh Castle. The route is lined with tourist shops but be sure to explore the narrow alleys called closes that lead off the Royal Mile. Enjoy Edinburgh on your own or via Azamara Shore Excursions®. Invergordon is the deep water port for Inverness, the capital of the Scottish Highlands and your gateway to an area of the Highlands known as the 'Great Glen'. Travel 20 miles north to the picturesque town of Dornoch to see its sandstone buildings, beautiful domestic gardens and tiny 13th Century cathedral. Ten miles further you'll find the fairy-tale ancestral home of the Clan Sutherland - Dunrobin Castle - one of the oldest inhabited houses in Scotland, dating back to the 13th century. The stunning formal gardens which run down to the sea are based on those at Versailles and were laid out in the 1850s. Daily displays of the ancient sport of falconry take place in the gardens. Less than an hour south is magnificent Cawdor Castle, the setting for setting for Shakespeare's Macbeth. The 14th century home of the Thanes of Cawdor is considered one of the most romantic stately homes in the Highlands with its fine collection of rare tapestries, portraits and furniture plus lovely gardens and grounds. Enjoy Invergordon on your own or via Azamara Shore Excursions®. MAX FAULKNER & FRED DALY: Today both flights play Castle Stuart Golf Links. One of the newest additions to the links courses of Scotland. Castle Stuart runs along the shores of the Moray Firth to the east of Inverness with wonderful views over to the Black Isle. Six holes hug the shoreline while the remaining holes are played over a terraced slope so views out to sea are ever present. Already included in the World's Top 100. 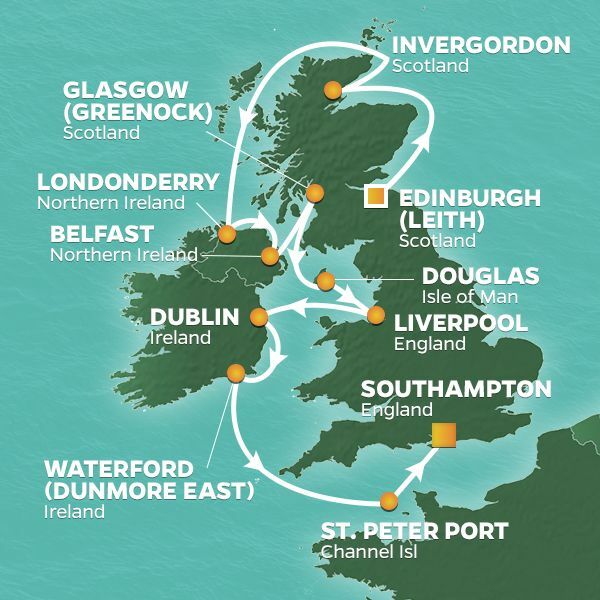 A full day at sea as Journey sails Scotland's northern coast line including the Hebrides, an archipelago comprising hundreds of islands off the northwest coast. Here's your chance to reset with the help of four restaurants plus cafes and lounges, a pool, sun decks, a spa, fitness center, jogging track, hair salon, shops, casino and cabaret lounge. Azamara's clubhouse style ambience provides a hybrid of luxury and big-ship cruising with every amenity presented in an intimate setting with superb service. Note that the best cocktails are found along with the best views on Deck 10 in the Living Room where you can admire the Murano glass and gaze out the floor-to-ceiling windows. Today attend the final round of The 148th Open at Royal Portrush. It The Dunluce Course at Royal Portrush Golf Club in Northern Ireland holds the distinction of being the only club outside of Scotland and England to have ever hosted The Open which it did in 1951. The club was founded in 1888 as a nine hole layout. In 1929 legendary Harry "H.S" Colt designed Dunluce through rugged links land with constant changes of both direction and elevation. Be sure take in the par four, 411 yard 5th , which is played to a green hanging on the edge of a cliff along with the 16th, Calamity Corner, a 210 yard par 3 requiring a solid strike over a yawning chasm which must be cleared to stand any chance of making par. A convenient transportation schedule will operate between the ship and the championship venue. SIGHTSEEING: The city of Derry, or Londonderry, is the second largest in Northern Ireland behind the capital, Belfast. Said to have been founded in the 6th century by Saint Colmcille (or St Columba), Derry was renamed Londonderry in 1613 upon the award of its Royal Charter by King James I. Through the siege of the walled city in 1689 to its key strategic role in World War II, Derry has been influential in the shaping of the world around it. In 2013, it holds the honour of being the UK's first City of Culture. Belfast in the early 20th century had the largest and most productive shipyard in the world, gaining global renown with the launch of the RMS Titanic. Located on the slipways where she was built is a stunning new museum, opened in time for the 100th anniversary of Titanic's only voyage and tragic demise. Today the city and riverfront are undergoing a 21st century transformation, but many exuberant Victorian and Edwardian buildings still sport the carved heads of kings and queens. As you explore the city, keep an eye out for 'the murals'. These somewhat troubling freelance works appearing on building walls provide insight into the period known simply as 'The Troubles'. MAX FAULKNER: Today play Royal County Down. Located in the town of Newcastle to the south of Belfast. Consistently ranked in the top 10 courses in the world, this is a true test of links golf set against the magnificent backdrop of the Mountains of Mourne. Host to the 2007 Walker Cup Match featuring a young local by the name of Rory McIlroy, and an all-star USA lineup. FRED DALY: Today play Portstewart. The club is continually overshadowed by its more illustrious near neighbour Royal Portrush, yet serves as 2017 host to the European Tour's Irish Open and for many keen observers it is one of the finest layouts in Northern Ireland. In particular its front nine plays through sand dunes every bit as impressive as Ballybunion and Royal County Down. This reinvented industrial center in western Scotland has solidified its reputation as a cultural hub. Charles Rennie Mackintosh is one of the first names to know; he was a prodigious architect, interior designer and artist, and the city has a wealth of his work. Stop by his Willow Tea Rooms for a cup of tea and a scone. The Kelvingrove Art Gallery and Museum whose blue and gold inlaid ceiling, Art Deco hanging lamps and marble floors are sufficient reason to visit, let alone the impressive art collection that includes Salvador Dal's controversial 'Christ of St John of the Cross'. Glasgow has an abundance of excellent seafood dining. The Crabshakk is perfect for daily catches including ruby red langoustines. The oyster bar at Rogano in Exchange Square is where power brokers celebrate deals with a glass of Champagne and a dozen oysters in a space designed to look like a 1930s Art Deco cruise liner. At the Pot Still, an institution that dates from 1857, choose from over 450 malt whiskies like Lagavulin or Arran. Enjoy Glasgow on your own or via Azamara Shore Excursions®. MAX FAULKNER: Today play Prestwick Golf Club one of the world's oldest clubs and whose very testing and traditional links hosted the very first Open in 1860. The winner was Willie Park from Musselburgh with a score of 174 for thirty six holes, two shots clear of the legendary Tom Morris. Prestwick was home to the first eleven championships and then held it jointly along with The Royal and Ancient Golf Club of St Andrews and The Honourable Company of Edinburgh Golfers (Muirfield). Prestwick's twenty fourth and last Open was in 1925 when Jim Barnes from the USA won. Only the Old Course of St Andrews has hosted more Open championships than Prestwick. FRED DALY: Today play the Ailsa Course of Turnberry. Lying on a spectacular curve of rockbound coast, the coastal scenery is magnificent especially from the 4th through the 11th and passing the famous landmark lighthouse at the turn. No one can ever forget the 1977 'duel in the sun'' between Jack Nicklaus & Tom Watson. In 2009, the Ailsa Course hosted The 138th Open when when 32 years later Tom Watson almost clinched the championship as a 59 year old, losing out to Stewart Cink in a play off for the famed Claret Jug. The tiny Isle of Man has a lot to offer. Douglas' lovely seafront is lined with picturesque hotels and restaurants, and can be traversed by horse-drawn trams as it has been since 1876. There's a medieval fortress in Castletown; a ruined castle on the Isle of St. Patrick where tales of Vikings, monks, and a ghost dog abound; and the village of Cregneash, where people live in thatched cottages, speak the native Manx language, and practice traditional trades and crafts. Front gardens on residential streets are a standout, awash in colour and scent. Enjoy The Isle of Man on your own or via Azamara Shore Excursions®. OPTIONAL GOLF: Today we offer an opportunity at supplementary cost for golf at the delightful Castletown Golf Links. This traditional links course designed by Old Tom Morris in 1892 and later updated by MacKenzie Ross is set on a small peninsula of land jutting out from the South-Eastern tip of the island and is entirely surrounded by the sea on all three sides affording spectacular views from every hole. The cost per person is $295 to include green fees one forecaddie per group, round trip transportation, management and handling of golf equipment, various novelty prizes on selected holes, open bar, homemade snacks on the golf course plus barbecue following play, and services of Castletown Golf Links staff throughout the day. Places are limited. Early sign up essential. Liverpool is a UNESCO World Heritage City. It offers a unique mix of contemporary and classic architecture. The city's many exclusive independent boutiques and unique gift shops make it one of the leading retail destinations in England. It is a sports mecca with its Premier League football, Rugby League club, major championship golf at Royal Liverpool (Hoylake) and Aintree Racecourse. Best of all, it is home to The Beatles. You can walk down Penny Lane. You can visit Strawberry Field which was a Salvation Army children's home said to be the place that inspired John to become a musician. Visit the site and have your photo taken next to the famous gates. Enjoy Liverpool on your own or via Azamara Shore Excursions®. MAX FAULKNER: Today play Royal Birkdale A course which provides a formidable test of links golf with each hole running in valleys between towering sand hills. Royal Birkdale hosted the The 137th Open in 2008 when Padraig Harrington lifted the Claret Jug to complete back to back wins, and it is again host in 2017. It was of course the site of Arnold Palmer's Open win in 1961. The club hosted The 146th Open in 2017 won by Jordon Spieth over Matt Kurchar with a sensational finish. FRED DALY: Situated next door to Royal Birkdale, Hillside Golf Club is widely regarded as the best links never to have hosted The Open although it has been a final qualifying site for the event on many occasions. The links weaves through sandhills and tranquil pines to deliver a variety of holes certain to test the best players. The course is well known for its wonderful conditioning and slick greens. The back nine holes are considered among the best in Britain. There is a lot to do in Dublin. A good place to begin is The National Museum of Ireland on Kildare Street for a well-designed archaeological collection featuring Bronze Age gold jewelry and Viking swords. The stars of the show are the 'bog people' - preserved corpses of men who were killed (presumably sacrificed) and tossed into peat bogs during the Iron Age. The preservative qualities are remarkable. Dublin is home to St Patrick's Cathedral of course but much of Ireland's history can be read in Christ Church Cathedral, which dates back to circa 1030. The medieval crypt is full of treasures plus the belfry tour (11:30 a.m. and 1:15 p.m.) provides a beautiful view and an up-close look at the flying buttresses, as well as the chance to try bell-ringing. Dublin's booming culinary scene is found along Exchequer Street where The Green Hen has won many admirers with its combination of French atmosphere and Franco-Irish cuisine made with locally sourced ingredients. Try the pan-fried duck breast. Finally, while craft beer is certainly the popular new thing, a pint of 'the black stuff' is still required drinking on any trip to Dublin. The Guinness Storehouse museum at the St. James's Gate brewery explains how the stout is made and how to pull a proper pint at the correct 45-degree angle and waiting 119.5 seconds before topping it off. Take it up to the Gravity Bar, where the 360-degree view of Dublin is worth lingering over. MAX FAULKNER: Today play Portmarnock Golf Club ranked No. 49 in Golf Magazine�s Top 100 Courses in the World. This windswept links features devilish pot bunkers and low dunes that have challenged legendary golfers of every era. Arnold Palmer partnered with Sam Snead to win the 1960 Canada Cup on the Old course and The King described the 15th as the best par-3 in golf. The Viking traders who founded Waterford in 914 were not the first to settle in this vicinity; Neolithic standing stones and megalithic tombs testify to much older cultures. A veritable march through the centuries continues with Norman forts, medieval abbeys, and numerous manor houses of 17th and 18th century vintage surrounded by primeval forests, and delightful gardens perfect for strolling. Experience the best of England and France in Guernsey. Take in postcard-worthy views of brightly colored houses, idyllic gardens, and cliffside paths from St. Peter Port. When the sightseeing is over, stop at one of the many bistros for an unforgettable meal. Then, spend some time shopping in the up-and-coming boutiques for the perfect souvenir. Max Faulkner was an Englishman and famously won The 80th Open at Royal Portrush in 1951, the only time it was held away from Scotland or England prior to this year. Faulkner was introduced to golf at a young age by his father, a club professional who had once been an assistant to the legendary James Braid. Faulkner played in The Open an amazing twenty six times! Of course, golf was not the global game it is now, and as a result he never played in any of the other three major championships, however he did play in five Ryder Cups, including the famous 1957 event at Lindrick, which was Great Britain and Ireland's only victory against the USA between 1933 and 1985. Fred Daly wwas born in Portrush, Northern Ireland and was a regular professional tournament winner in the late 1940's. He is best known for winning The 76th Open at Royal Liverpool in 1947 while he was the club professional at Balmoral Golf Club in Belfast. In winning The Open he became the only Irishman to do so until Padraig Harrington won it in 2007, and was also the only Northern Ireland major winner until Graeme McDowell won the 2010 US Open. Located on Langness Peninsula in Isle of Man, the links at Castletown is surrounded on three sides by the Irish Sea. Set high above sea level, the course offers breathtaking views of the rocky coast and water - sharks, seals and dolphins below. The greens are smooth and slick, bentgrass and fescues, provide a true roll. The 17th is a 421-yard par-4 named “Gully.” Through the decades the elements have eroded a chunk of the land and a 200-yard carry is required to reach the fairway. The familiar host of the 2006 Ryder Cup sits amid 550 acres of mature woodland west of Dublin City. There are 14 lakes on the property and water hazards abound on this well-manicured design, considered one of the finest parkland courses in Ireland. It features large greens with severe slopes and it’s only fitting that Palmer’s favorite hole was No. 4, a risk-reward par 5 where overhanging trees guard the right side and the green entices golfers to take a swing. Max Faulkner was an Englishman and famously won The Open Championship in 1951 at Royal Portrush, the only time it was held in Northern Ireland prior to 2019. Faulkner was introduced to golf at a young age by his father, a club professional who had once been an assistant to the legendary James Braid. Whilst Faulkner played in 26 Open Championships, golf was then not the global game it is now, and as a result he never played in any of the other 3 major championships, however he did play in 5 Ryder Cups, including the famous 1957 event at Lindrick, which was Great Britain & Ireland's only victory against the USA between 1933 and 1985. Fred Daly was born in Portrush, Northern Ireland and was a regular professional tournament winner in the late 1940's. He is best known for winning the 1947 Open at Royal Liverpool while he was the club professional at Balmoral Golf Club in Belfast. In winning the Open Championship he became the only Irishman to win The Open until Padraig Harrington won it in 2007, and was also the only Northern Ireland major winner until Graeme McDowell won the 2010 US Open.